Rosenberg, Justin 2013. Kenneth Waltz and Leon Trotsky: Anarchy in the mirror of uneven and combined development. International Politics, Vol. 50, Issue. 2, p. 183. From Hitler To Bismarck: ‘Third Reich’ and Kaiserreich in Recent Historiography. 1 Fritz, Fischer, Germany's aims in the First World War (London, 1967). 2 Röhl, J. C. G., Germany without Bismarck. The crisis of government in the Second Reich, 1890–1900 (London, 1967) and Röhl, J. C. G. (ed. ), Philipp Eulenburgs politische Korrespondenz (3 vols., Boppard am Rhein, 1976–83). 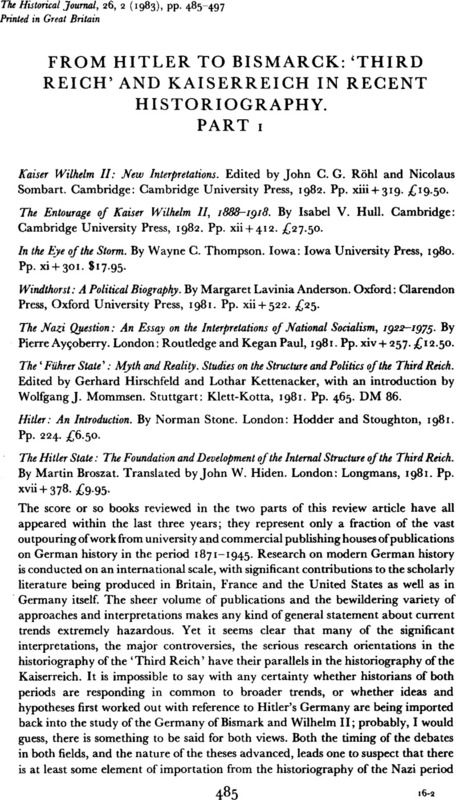 3 Kennedy, Paul, The rise of the Anglo-German antagonism, 1860–1914 (London, 1980), p. 9. 4 I have discussed Hull's book at greater length in a forthcoming review in History. 5 See Terry, Cole, ‘Kaiser versus chancellor: the crisis of Bülow's chancellorship 1905–06’, in Evans, Richard J. (ed. ), Society and politics in Wilhelmine Germany (London, 1978). 6 Karl, Dietrich Erdmann (ed. ), Kurt Riezler: Tagebücher, Aufsätze, Dokumente (Göttingen, 1972). 7 Nor is it entirely free from misprints and errors. There are some oddities in the German on page 481, for instance; Samoa is misspelt on page 285; the paragraphing has gone awry on page 244; on page 260 the author appears to believe that Windthorst freed the Centre Party from the bugbear of anti-semitism for all time; and a gremlin seems to have got into the printing press when it came to setting dates (e.g. pages 164, 203). 8 Marx-Engels selected works (Moscow, 1950), p. 225, quoted both in Paul Kennedy's contribution to Kaiser Wilhelm II (p. 143) and by Tim Mason in The ‘Führer State‘, p. 37. 9 There are also a few oddities in the translation (on page 188 the Freikorps appear as ‘commandos’), a handful of solecisms (‘it's’ for ‘its’ on page 201, for example), some misprints in the German (the printer has been too free with umlauts, e.g. on page 118, where we encounter an author called Goëthe), and even a small number of errors (as on page 60, where M. Ayçoberry evidently thinks Otto Bauer was a German Social Democrat). 10 I use this term to indicate that what these historians emphasize is the self-generating radicalism of political and administrative structures, independent of the intentions of those operating within them or of socio-economic forces acting upon them from outside. 11 Martin, Broszat, Der Staat Hitlers. Grundlagen und Entwicklung seiner inneren Verfassung (dtv Weltgeschichte des 20. Jahrhunderts, vol. 9, Munich, 1969).